Recently there was an interesting discussion around a photo of a beautiful pointed kitten and what breed of cat he may be. People suggested he was a Siamese, Traditional Siamese (due to his rounder head), Birman, Ragdoll, Snowshoe or Tonkinese. The cat in the image above has a similar appearance, with a rounder face and a slightly fluffier coat than that of the modern-day Siamese. Are all pointed cats full or part Siamese, Birman or Ragdoll? Confusion around pointed cats happens a lot because this coat colour is typically associated with purebred cats, especially Siamese, Ragdolls and Birmans. The pointed colouration did indeed originate in the Siamese cat. The gene is called Himalayan. 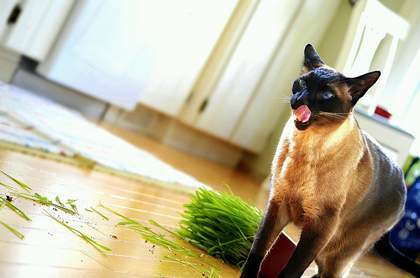 Siamese cats first made their way to the East in the late 1800’s and from there, the Himalayan gene made its way into the general cat population. The Himalayan gene is interesting, it is a form of incomplete albinism and is heat sensitive, meaning the cat is actually a solid colour, but the gene inactivates the production of melanin-responsible for coat colour-on warmer parts of the body, leaving only the extremities including the ears, nose, and tail darker. So a seal point Siamese is, in fact, a black cat, but the Himalayan gene has prevented the black colouration from showing on the warmer parts of the body. Pointed kittens are born all white, which makes sense because they are in a constantly warm environment in their mother’s uterus. The pointed colouration develops as the kitten matures. Pointed cats will often become darker in winter. The Himalayan gene is recessive, meaning both parents have to pass on the gene for their offspring to have points. This explains why a non-pointed cat (or even both parents) can produce pointed offspring. The parents don’t have to be pointed in order to produce pointed kittens, they just have to carry the recessive Himalayan gene. In contrast, two pointed cats can only produce pointed offspring. 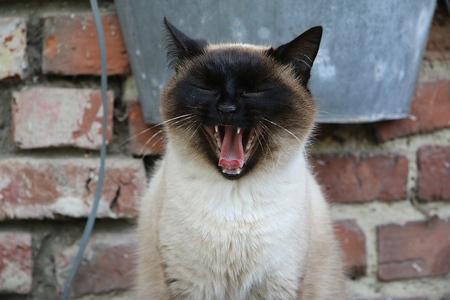 Burmese – Burmese cats are pointed, but the gene responsible is different to that of the Siamese. The gene responsible for Burmese is known as cb. While the Burmese is a pointed cat, the contrast between the points and the body colour isn’t quite as defined as that of the Siamese. 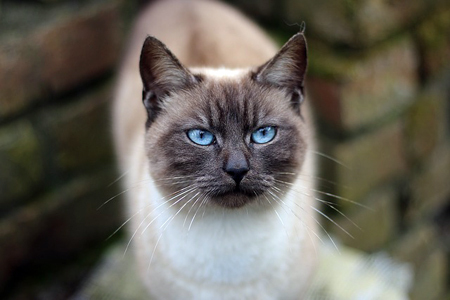 Tonkinese – This breed is a hybrid of the Burmese and Siamese. 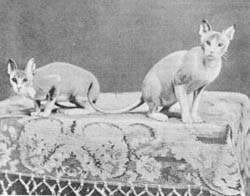 While the Siamese gene comes in two copies cs/cs (one from each parent), and the Burmese is cb/cb, the Tonkinese is cb/cs. 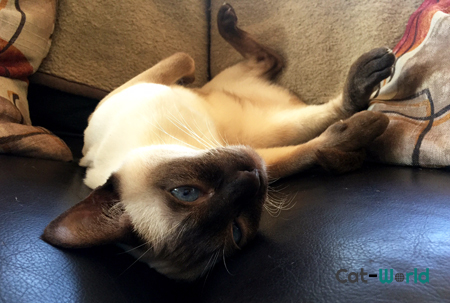 The Tonkinese coat comes in three patterns. Solid (more like the Burmese), Mink (half way between the Burmese and the Siamese) and Pointed (similar to the Siamese). Eye colour varies according to the coat colour. Solid=yellow, mink=aqua and pointed=blue. Below is a Tonkinese cat. The Ragdoll cat comes in several patterns including colourpoint. The image below shows the patterns this breed comes in. Cat Ancestry is a novelty test to investigate ancestry and determine which of the 8 geographic regions your cat descends from Western Europe, Egypt, East Mediterranean, Iran/Iraq, Arabian Sea, India, South Asia and East Asia. Your cat’s sample will be compared to the 29 reference populations from four of the regions: Western Europe, South Asia, Eastern Mediterranean and Arabian Sea. If your cat associates strongly with one of the 29 reference populations, the information is reported. In addition, the Cat Ancestry report includes the genetics of your cat’s coat colors, fur length, and fur type. The takeaway message here is all Siamese, Birmans and Himalayans are pointed cats, but not all pointed cats are purebred as the pointed gene has made its way into the general cat population.